I’ve paid attention to Yelp pretty much since its inception, admiring its growth from afar and debating its potential to either disrupt or expand the customer base of the average small business owner. But ever since my former hometown weekly, the East Bay Express, published its controversial “Yelp and the Business of Extortion” column last February about the purported tactics of some of Yelp’s sales representatives, I’ve taken an even keener interest. The Express’s Kathleen Richards interviewed a handful of business owners who claimed that Yelp sales reps had offered to take down negative reviews in exchange for advertising, and some who were even threatened with negative reviews if they did not advertise. Naturally, Yelp decried the report and defended its practices. And despite a follow-up story in the New York Times about Yelp’s “power to make or break a restaurant or small shop,” it remained unclear exactly what had happened. This wasn’t the first story that suggested Yelp’s sales reps were pursuing some questionable tactics. Paul Smalera of Slate / The Big Money was skeptical of the anonymity of Richards’ story, rightly asserting that “Yelp is simply a different animal than most merchants are used to dealing with.” He asked business owners and Yelpers who had a beef to share it with him for publication. While he did find Yelp engaged in high-pressure sales tactics and its review filter deleted some legitimate reviews (more on this later), he didn’t find evidence to support Richards’ extortion claims. But, where there’s smoke, there’s usually at least some fire…how much of it was business owner confusion, how much was algorithmic, and how much was over-aggressive sales? If one of the smartest guys in tech didn’t know for sure, I sure don’t either. My guess is that there were some misleading or commission-hungry sales reps who’ve since been re-trained or re-assigned, and perhaps the throttle on Yelp’s review filter might have been set a little too high in the Spring. The fact that Yelp was even a “target” of this kind of coverage signaled in some way that it was now a force to be reckoned with–as Greg Sterling pointed out. Companies like MerchantCircle have been using underhanded sales tactics for years, or at the very least, “struggled with execution” in exactly the same manner as Yelp, and have not yet garnered media attention for these tactics outside our little SEO community. But whatever the actual problem at the root of the controversy, the entire episode seems to have “woken Yelp up” about the need to do a better job of seeing things from the business owner’s–rather than the Yelper’s–standpoint. Stoppelman and his team had been wildly successful at growing Yelp’s userbase, and its general media footprint, by remaining 100% behind their users. But despite their “tech darling” status (witness Jason Calacanis’ fawning questions to Stoppelman at the Local Search Summit) and consistent pasting of Citysearch in the unique visitor rankings, it’s been Citysearch–not Yelp–that’s been profitable for the last several years. Since sites like Yelp make money off of advertisers, not users, it was clear that the company was going to have to find a way to appeal more to business owners in order to get them to buy advertising. Almost immediately, Yelp responded to the controversy by allowing business owners to respond publicly to reviews. Yelp beefed up and began to do a better job at promoting its Yelp for Business Owners offering–which had already displayed a lot of the rich traffic and review data that Google started to offer in its Local Business Center in June–and then some. The interface allows for direct communication with Yelpers, provides day-part information (essentially business intelligence) for when Yelpers are most interested in a business, and even now even echoes some of the same ideas for how to respond to reviews that Miriam Ellis and Lisa Barone authored earlier in the year. Yelp sends weekly emails to registered business owners–whose numbers are in the “tens of thousands,” according to Donaker–showing them number of page views and providing tips for how to use Yelp to maximum effect, as well as other helpful local search articles. Yelp has also made a conscious effort to be more transparent about their advertising offering–it’s now abundantly clear that advertisers are allowed to promote a “favorite review” to the top of their list, and nothing more. Additionally, a self-serve ad product is coming out soon–which I as a search marketer hope is just as much of a no-brainer as Google’s recent Local Listing Ads beta. Luther Lowe was made “Local Business Outreach Manager” in April, and they recently filled a position for Director of Business Marketing (formerly posted at yelp.com/jobs). This is an impressive set of initiatives for a company that is still in “start-up” mode to have undertaken in the course of only eight months. According to Geoff Donaker, Yelp was cash-flow positive in Q2 and Q3 of 2009, but expected to lose money in the succeeding quarters, due to expansion plans. Kelsey Group analyst Matt Booth speculated that Yelp’s annual revenues were around $45 million–impressive, but not earth-shattering. So they’ve still got a lot of room for growth (i.e. recruiting additional businesses to advertise on the site). Some percentage of business owners seems to have had an inherent mistrust of Yelp and its community for years — witness Greg Sterling’s October 2007 column about a mom-and-pop coffee shop (in my former neighborhood, no less) that prominently displayed a NO YELPERS sticker on its front window. Donaker admitted this last month. The flip side, however, is that more progressive, tech-savvy business owners often love it and see its huge potential to drive customers and mindshare for a fairly low cost. In late February, I visited a local pizza shop in Emeryville, CA (not a client or even a friend–just great pizza) that had been open less than two weeks. As I was waiting for my pizza, I struck up a conversation with the owner, a guy in his early 30’s, about how business was going, and had he claimed his Local Business Center listing yet? He didn’t even know that the Local Business Center existed, much less that he could claim his listing. But he did know how important it was to make sure he was on Yelp as soon as his business opened, and as a brand-new business had accrued 22 reviews in only two or three weeks! He whipped out his iPhone to show me. Yelp needs to do a better job of highlighting positive stories like these–a difficult balance to walk, of course, without showing favoritism towards any one business. Something along the lines of case studies of non-advertisers might be a way to do it. They also need to continue to provide tips for acquiring reviews that are not seen as self-serving. According to Lowe, while Yelp does not condone review solicitation per se, they do encourage business owners to use language such as “check us out on Yelp” in promotional emails or newsletters, which they’re confident is a signal for active Yelpers to leave a review. 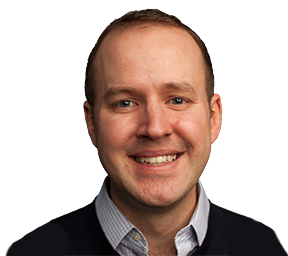 Additionally, they were fine Michael Jensen‘s ingenious idea for businesses to offer free wi-fi and drop visitors at their Yelp profile by default–although if a Yelp newbie leaves a review via this strategy, it’s more likely to get filtered unless they engage further with the site. Another major hurdle, highlighted by Matt Booth, is that their core demographic of restaurants tends to be a high-churn, low-spend industry (vs. the medical or legal professions, for example). While there are a surprising number of long-tail reviews on Yelp (29% are restaurants, 22% have a “retail” focus), continuing to branch out into the long-tail of business categories that aren’t often reviewed–and business advertisers in those verticals–will be a key indicator of Yelp’s success going forward. Booth asked Donaker in Los Angeles: “What made Yelp work?” His first response was that they started using a one-city-at-a-time model that went against conventional wisdom. Needless to say I was quite surprised that the one-city-at-a-time model went against conventional wisdom! Who are these “wise people” in Local search arguing for an immediate national roll-out? Arguably the two most successful properties in Local Search, Craigslist and Yelp, both started with the one-city-at-a-time model. Donaker’s second response was that their review filter “creates a level of trust among users.” I was somewhat surprised to hear this logic, since I’d expect that Yelpers would demand that each of their reviews impact the business they’re reviewing in some way. After all, many Yelpers see the site as their “lifestyle blog.” I’d surely hate for WordPress to filter a post that didn’t meet its quality criteria in some way! But the technology behind this filter is one of the things that makes Yelp Yelp, separating the shill reviews or spam reviews from legit user-generated content. Yelp seems to be willing to sacrifice a few “false positives” like Robert Dall in the Smalera / Slate.com article above to gain the trust of its wider base of users who largely rely on Yelp for unbiased recommendations, rather than as a publishing mechanism. Being even more transparent and proactive in letting business owners this filter exists, as Donaker was at the Kelsey show, might have prevented at least some of the company’s headaches in the Spring. But it’s surely a hard concept to explain to an SMB that his best customer’s legitimate (but only) review on Yelp was getting filtered due to lack of confidence in its legitimacy. It’s also *very* rare, according to Yelp representatives, that an Elite Yelper–or even an active one like Dall–will have his or her reviews filtered. And as Yelp continues to iterate the algorithm, it’s also likely to get better at shill and spam detection. The lifestyle blog mindset also brings up an interesting potential pitfall for Yelp–what happens when more and more elite Yelpers decide to go it alone, like Dall, and actually start their own blogs? At some point Yelp may need to consider a review syndication strategy, something along the lines of what outside.in is doing for HyperLocal news content. 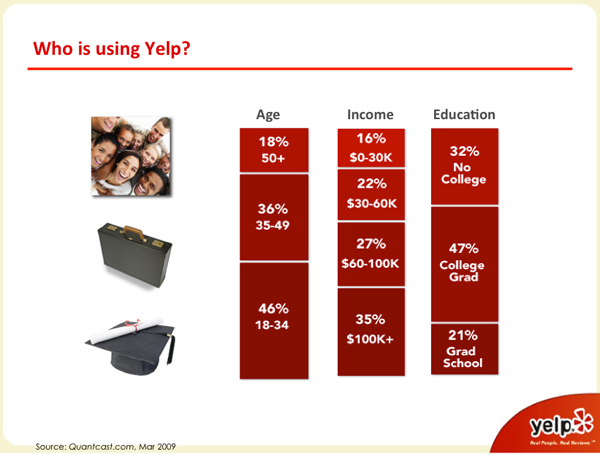 There’s also the obvious generational gap in terms of the demographics of Yelp’s userbase–even if it’s not as large as I would have thought. But there’s an obvious skew in the number of reviews, and the kinds of establishments that get favorable reviews, towards the slightly-funky, teens/twenties crowd. One of my favorite bars in Portland doesn’t even rank in the top 30 even when I include my neighborhood as a modifier. Not coincidentally, I rarely see anyone under the age of 35 in the entire place. It’s expensive, dark, and a little stuffy. Not the kind of place a typical Yelper is going to frequent. Some level of personalization or customization of results by strengths and weaknesses of particular businesses could help Yelp appeal to a wider audience and grow its base of users without being burdened by the cost of expanding into new cities. The on-again, off-again acquisition last month got me thinking about the relative attitudes of the two parties involved. Both Yelp and Google (Maps) are technology companies. By-and-large, business owners don’t have the time to figure out technology. It’s why I think the self-serve, flat-rate ad products that will be offered by both companies within the next few months are likely to be so successful. I think the successes of both these technology companies will be determined in large portion by their ability to translate technology into the real world. To my knowledge, no one in a senior position at either Yelp or Google Maps has run a small business or even worked in one/with one for an extended period of time. I could very well be wrong about this. But the tone-deafness of Yelp’s public statements pre-April-2009 and the continued tone-deafness of Google’s algorithmic approach to customer service certainly give that impression. Yelp, however seems to have matured in its perspective, understood perhaps the most significant impediment to its success, and adjusted its mindset to try to overcome that hurdle. Will Google be able to do the same, or will “all algorithm, all the time” ultimately drive business owners away, and into more verticalized offerings–or horizontal competitors like Yelp? Yelp already offers a much better user experience, and arguably better results when it comes to “recovery” type searches. And they seem to be coming on very strong on the business owner front. Back on the user experience front, while Google has continued to push Community Edits as a major component of its efforts to clean up business data, Yelp seems to have recognized that pure democracy may not be such a great long-term solution. Its review filter, though puzzling for a site that seems to place the opinions of the masses in such high regard, may actually lead to a higher-quality Local index in the long run than Google Maps. While I am neither pro-Yelp nor anti-Google–if anything I am just the opposite in my own personal search behavior, and marketing advice to the typical small business owner–despite their struggles of the previous 18 months, Yelp is quickly becoming a more complete, well-rounded company in the Local Search space. I think it’s why they may have been such a desirable acquisition target for Google. If a deal indeed doesn’t end up happening, it’ll be interesting to see the two companies react to each other’s moves as they jockey for market share.